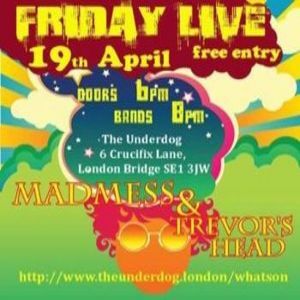 Next on the bill we have 2 AWESOME bands with banging rock sounds playing at live at The Underdog on Friday. Check out Madmess and Trevor's Head. Free entry. Doors at 6pm. Bands from 8pm. London based power trio from Portugal, enjoy the ride! Ranging from influences from the 60's to the modern psychedelic stoner rock and more heavy weight sonorities, Madmess consists of a mix between melodic chord progressions and ambiences and brickwall fuzzy riffs. Is a thick, greasy fondue of stoner rock, punk and grunge from a landfill town in the commuter belt called Redhill. They released their third LP, 'Soma Holiday', through APF Records in April 2018 and have pursued a relentless gigging schedule for the last 4 years. With a constant presence in Southern England and a European tour under their belts, they are now coming for the rest of the UK and beyond. A 3 minute walk from London Bridge Station - leave via THE SHARD exit and turn left, The Underdog is approx. 400 meters on the left, just past the traffic lights.